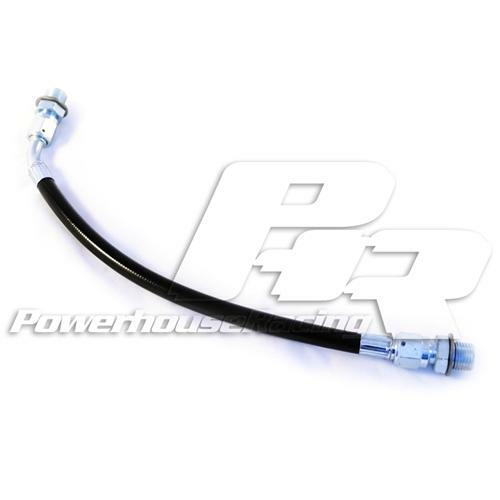 Powerhouse Racing now offers a great option for those who want to upgrade their power steering line. The PHR High Pressure Power Steering Line is a direct replacement for the factory line, but is cleaner and easy to install and uninstall. It routes from the Power Steering Pump directly to the steering rack and eliminates the unnecessary excess line that runs under the oil pan (supposed to be a cooler but is very ineffective). This line also eliminates the Steering Idle Up Valve that is not very eye appealing and basically useless on the MKIV. The PHR High Pressure Power Steering Line is Teflon-Lined Braided Stainless that is resistant to Power Steering Fluid and holds extremely high pressure and temperature. This is a clean, nearly fail-proof line that should outlast the life of your car.